Risa is married to a local politican and has a teenage son from a previous marriage. She owns a local diner and she seems to have it all. Turns out though that her first husband disappeared years ago and has been declared legally dead. Risa has no idea what has really happened to him. Until the local high school’s Scrimmage Day when he shows up again. Sean comes back out of the blue. A recovering alcoholic, he is now in recovery and has come back to his small hometown to confess to the murder of his and Risa’s high school friend Carol, who was killed years ago. Sean is having flashbacks of her dead body and he is convinced he is the killer, but Risa cannot fathom her former husband committing such an atrocity. 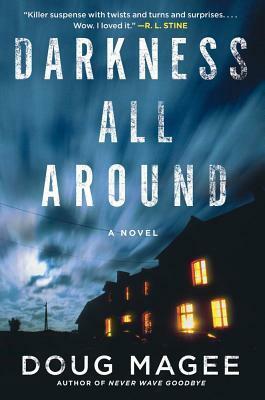 Darkness all Around was good but not great. The mystery in itself was interesting enough but I felt like Magee didn’t go into the initial murder enough. There was a chapter at the beginning of the book detailing the discovery of Carol’s body, but I never felt that there was a picture painted for the reader of the actual murder, which is kind of important when you’re talking about a murder mystery. I also had issues with the characters. They seemed a little two dimensional to me. I was able to understand who they were and what they were about, but I never really ended up caring about them or drawing a connection with any of them. It was unfortunate because I liked Sean and Risa and I was intrigued by their story, especially that of Sean, but it just never panned out. My two main concerns made this book just an ok read for me. I am glad I read it. It kept me involved for the most part. I just don’t think I’ll remember much of it in a few weeks time. 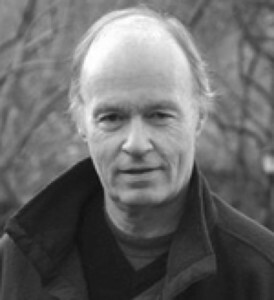 Doug Magee has been a photojournalist, screenplay writer, children’s book author, death penalty activist, film producer and director, war protestor, college football player, amateur musician, and the basis of the Aidan Quinn character in Meryl Streep’s “Music of the Heart.” This is his first novel. He lives in Spanish Harlem with his wife and two teenaged children. Learn more about Doug and his work at his website, dougmagee.com. Thursday, June 21st: You’ve GOTTA read this! Nicole Werner seems to have it all. She is a blond, virginal sorority girl and she’s living it up during her freshman year at a midwestern honors college. The tragedy strikes. She is killed one night when her boyfriend crashes his car near campus. He walks away unscathed but remembers nothing of the accident. Right from the start there are questions related to her death. Nothing is as it seems. Shelly, a middle aged woman who works on campus witnesses the accident and knows that when she left the scene, after authorities arrived, Nicole was alive. Yet immediately following the accident, local news sources claim that the passer by who witnessed the accident left shortly thereafter without properly instructing authorities to the scene. Hours later, when the crash was subsequently discovered, Nicole was lying dead in a pool of blood. The Raising went back and forth between multiple narrators. One narrator, and probably the one I enjoyed most, was Mira, a professor on campus who taught a freshman seminar entitled Death, Dying and the Undead (which I would have taken in a hot second!). Mira is involved in anything related to death, including folklore, so she is immediately interested in Nicole’s demise, especially when some of the guys on campus start claiming Nicole isn’t dead . . . There was so much going on with this book that I don’t know where to start with my review. I recently started taking notes as I am reading, which has proven to be helpful, although in this case I really can’t fathom how I could turn my notes into a cohesive review. I will say that I was most interested in the blurb on the back cover, which compared The Raising to The Secret History. I would say, now that I have finished the book, that the comparison is accurate, however The Raising wasn’t quite of the caliber as its predecessor. That isn’t meant to be a negative, as Donna Tartt left some huge shoes to fill! 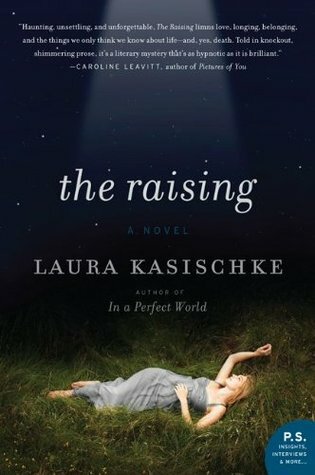 The Raising was a fast paced mystery that kept me wondering until the very end. I received a copy of this book as a gift. Karen Clarke is the type of college student that fades into the background. You wouldn’t notice her. She never gets into trouble, she completes her work on time and everyone knows what to expect from her. That all changed one summer during the 90s when she meets a free spirit on campus named Biba Capel. Biba lives with her brother Rex and the two of them leave a bohemian lifestyle. They are very carefree, enjoying wine and music every night in the family home they share together, with not much else mattering. Karen is enamored by their lifestyle and she quickly abandons her old life to move in with the siblings. We know from the very beginning that something awful happened that summer, resulting in someone’s death, although we know not who the victim is. We also know that Rex has been imprisoned for a decade for the crime and that he and Karen have a daughter together. The rest of the circumstances remain a mystery that slowly unfolds throughout the book. I could see why Karen had such a fascination with Biba, but as the book wore on, I began to loathe Biba. In fact, loathe may not be a strong enough word to describe the dislike I felt for her. It was so ridiculous that Rex gave up ten years of his life for her, and I wish he would have thought it over before he decided to shoulder the blame. I suppose there is little chance that he would ever be able to fully realize what a selfish brat she was though. I was so happy that Karen was able to realize it though. I was GLAD she killed Biba at the end. I very rarely wish for someone’s death in a book, but the gall she had to try and come back to a daughter she abandoned with no thought for anyone but herself really irritated me. My cousin has been after me to read this book for weeks. 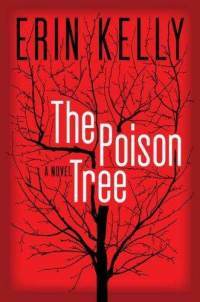 We often share book recommendations but I have never been hounded by her to read a book the way she did with The Poison Tree. After reading it, I can see why. It was a great psychological thriller and Kelly’s writing was perfect at keeping me invested in the story. Every chapter left me wanting more, so I would keep tearing through the book, unable to put it down. And as the story kept unraveling, it got more and more interesting. I will definitely be including this one on my Best of 2011 list. I purchased this book used from a book sale. 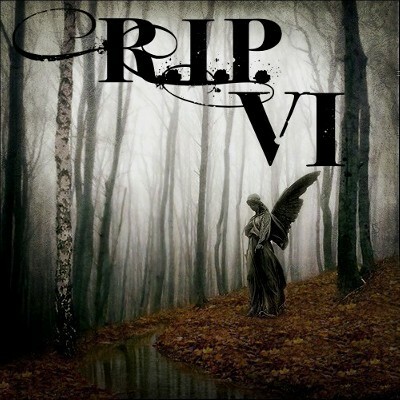 This book counts towards the RIP VI challenge. Charlotte and Nora are best friends by the time the 90s role around. They spend their afternoons at Charlotte’s house being watched by a high school girl named Rose. They look up to Rose and enjoy their time with her because she treats them as peers instead of little kids. Together, the three girls wile away their time during the summer of 1990, filled with curiosity and mischief. Their bond slowly begins to break down as summer turns to fall, culminating with Rose’s disappearance in November of that year. Charlotte and Nora both grieve over the loss of their friend and mentor. Immediately, they attempt any wacky scheme they can imagine in order to determine Rose’s whereabouts, even going so far as to steal Rose’s family cat in the hope that the senile animal will give them a clue. Eventually Rose’s memory and disappearance begin to fade, and although both girls will always be shaped by her absence, they both move on with their lives. The rift that had begun before Rose’s disappearance only widens, and eventually the girls lose contact with one another. Fast forward to 2006. Charlotte calls Nora out of the blue after Rose’s body is finally discovered. Nora agree to travel back to her hometown and ends up staying with Charlotte for a week as the story behind Rose’s death unfolds. 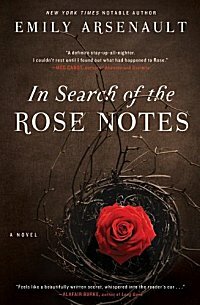 I will say one thing for In Search of the Rose Notes; it was readable. I picked it up one night and ended up reading over 100 pages before finally being overcome by sleep. The more I read though, the more the mystery seemed to take a back seat, as Nora’s issues take the forefront, including the disintegration of her friendship with Charlotte. I would have appreciated a little more suspense. I also had an issue with Nora’s husband Neil. It seemed like their relationship would play a bigger role in the book. Once Nora goes back to her old hometown, she is running into men that had an impact on her when she was younger. I started to wonder if this was going to be part love story, part mystery, but everything dealing with Neil seemed to peter out, and Arsenault’s attempts to draw him into the story seemed disingenuous. I thought In Search of the Rose Notes to be a valid attempt, but there were a few key elements missing that made it fall a bit flat to me. 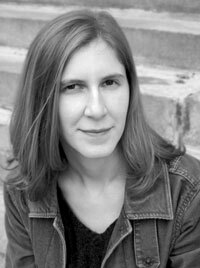 Emily Arsenault is the critically acclaimed author of The Broken Teaglass, a New York Times 2009 Notable Mystery. She lives in Shelburne Falls, Massachusetts. Visit Emily at her website. **I have a copy of this book to give away to one reader. If you are interested, please include your e-mail address in the comments section. I will choose a winner randomly next week. This contest is only open to US mailing addresses. Christine Lucas seems to be your normal, everyday middle aged woman, albeit with one major issue. Once she goes to sleep at night, she can’t remember anything. She generally wakes up every morning thinking she is a young woman, only to discover she is in fact married and a good twenty years older than she expected. She has absolutely no memory of her husband Ben and their life together, so he has to painstakingly recreate their lives for her every morning. The reader becomes aware pretty quickly that all is not right with the situation. Christine is secretly seeing a doctor behind Ben’s back, because he doesn’t want her to have treatment. Every day the doctor has to call Christine and tell her that she has a journal and where she has hidden it. Christine slowly begins to build up her memories by diligently writing down the events of every day and what she has learned about her past life. She slowly becomes aware that she can’t trust Ben, that he has been keeping secrets from her. I admit that Before I Go to Sleep was a little painful at first. The fact that Christine woke up every morning not knowing who she was or where she was grated on me a little bit. Once I realized the story wouldn’t be repetitive, it got a little easier for me to swallow. 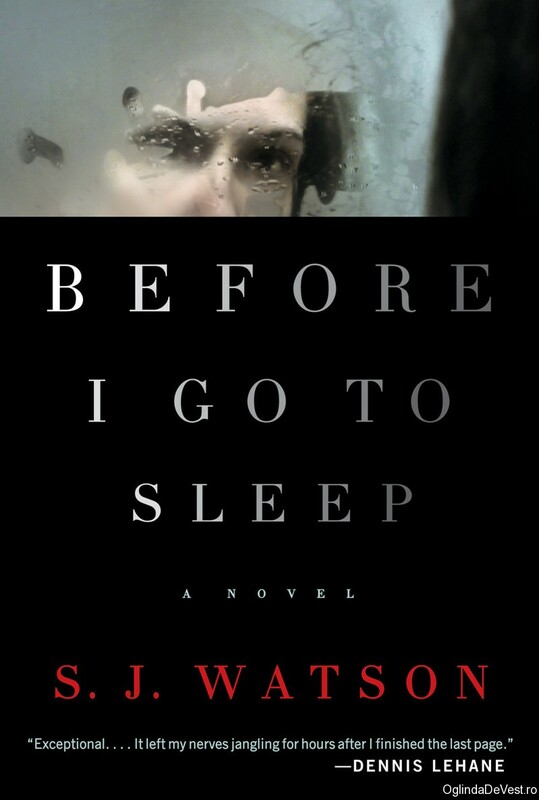 Overall I thought that Before I Go to Sleep was a wonderful psychological thriller. I had high expectations going into it, and I am glad to say those expectations were met. This is a great poolside read. It will keep you engrossed throughout. Garret Quirke is a pathologist in Dublin, Ireland in the 1950s when he stumbles across a case that has been hushed up by an obstetrician named Malachy Griffin. The case involves the death of a young woman named Christine Falls who apparently died in childbirth. Quirke immediately becomes suspicious of Mal’s involvement due to the cover up, and he sets off attempting to discover the circumstances surrounding Christine’s death. Mal and Quirke happen to be old friends who have since had a falling out. They married sisters; Quirke’s wife died in childbirth years ago, along with his infant daughter, and Quirke is still carrying a torch for his sister-in-law, Sarah, who is the sister he wanted to marry all along. The tension between Mal and Quirke is thick, and Mal is adamant that Quirke stay out of Christine’s case. Quirke is convinced that there is something untoward going on and he is unable to quit his inquiry, even when it becomes clear that there is danger involved. Christine Falls is a split narrative, with part of the story being that of baby Christine, the infant that survived. She is unknowingly sent to Boston and adopted out to a local family by a Catholic parish. The adoptive family is not without their own hardships, which adds a complex layer to the story. 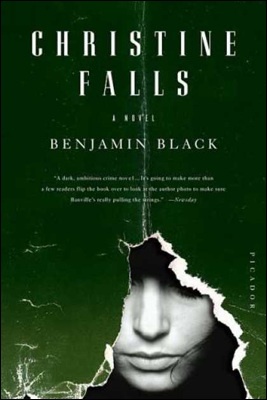 Benjamin Black is the pseudonym for Booker award winning novelist John Banville, whose work I have ashamedly not yet read (although I have had a copy of The Sea on my bookshelf for quite awhile, if that counts). It is for that reason alone that I bought this book for my Kindle. For those of you that frequent my blog, it has become glaringly obvious that I have been on a mystery kick for the past few months, so this fit the bill. Unfortunately, I didn’t enjoy this book as much as I would have anticipated. I am not entirely sure what it was about Christine Falls that didn’t resonate with me. I thought Quirke’s character was excellent, and I was also thought baby Christine’s adoptive parents were compelling characters and I looked forward to their portions of the book. Despite that, I just couldn’t get into the story and I just wanted it to be over. The mystery aspect was kind of weak, and I never had an AHA moment where everything came together. I will certainly give Banville another chance, but I am unsure whether his mysteries are for me. I purchased this book for my Kindle. It is the dawn of the 20th century, and Detective Simon Ziele is attempting to recover from the death of his fiance in a steamer accident. Her death has caused him to leave the city police force and join the force in the much smaller town of Dobson, New York. So far, the quiet pace has been comforting, but that all changes with the murder of Sarah Wingate, a young collegiate who was visiting her aunt in the country. Sarah is not your typical lady; she is a mathematician studying at Columbia University and the competition between the coeds is fierce. Sarah is attempting to solve a difficult mathematical formula. While you wouldn’t assume that a math problem would invoke such jealousy, Sarah’s peers are after her to discover her solution. It is unclear to Ziele whether this envy could have motivated a murder. Add to that the fact that Ziele is contacted by a man named Alistair Sinclair, a criminologist at Columbia. He believes he knows who the culprit is, but the problem is the suspect disappeared to weeks previously. Ziele is forced to decide whether he should heed to Sinclair’s hunch or whether he should go off on a different tangent. The fact that I bought this book is pretty shocking. 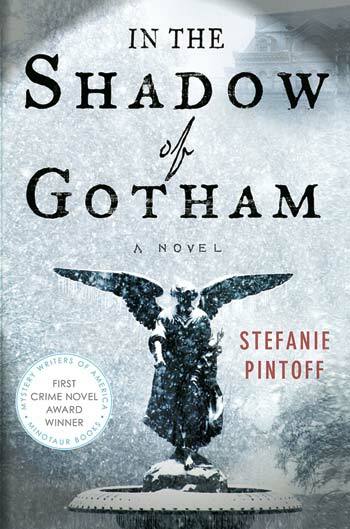 I tend to only buy books I have heard of before, or at LEAST heard of the author before, but I stumbled upon In the Shadow of Gotham at a used book sale, and for the price, I could see no reason to not take a chance on it. Not to mention I was on a huge mystery kick last month. I am glad I took a chance, because this book turned out to be really gripping. Was the whodunit aspect a mystery? Not really. I had the pool of suspects narrowed down fairly quickly, and my hunch turned out to be right, so I was a little shocked by the fact that Sinclair and Ziele didn’t pick up on it sooner. I suppose Pintoff had to make the book a little longer! One issue I did have with the book was the storyline of the dead fiance. It was mentioned on the back of the book, so I assumed that it would play into the book a lot, but it really didn’t. I kept hoping for more information on Ziele; how he felt about the situation, how he was coping, and what exactly happened to his fiance, but it was only touched on briefly a few times. Despite my few qualms about the book, the issues were minor, and overall I certainly thought it was a great plot that was finely written. I plan to read more Pintoff in the future. I purchased this book from a book sale.